[S485] Vance Barbour, "Ernest Barber," e-mail to James H. Holcombe, 6 December 2003. Ethel Lane Sheldon was born on 19 February 1887 at Mobile, Mobile Co., AL.1 She married Joseph Edward Skinner, son of Judge George Gaines Skinner and Mary Eugenia Hill, on 6 June 1906 at Mobile Co., AL. Ethel Lane Sheldon died on 18 August 1908 at Mobile, Mobile Co., AL, at age 21.1 She was buried at Magnolia Cemetery, Mobile, Mobile Co., AL. [S807] Find A Grave, online http://www.findagrave.com, memorial # 115382180. [S693] LeEric S. Marvin, GED. [S488] Marilyn Mosley Godley, "Julia Ann Holcombe," e-mail to James H. Holcombe, 4 Dec 2003. [S135] Judge Oliver Seymour Phelps Phelps Family, Page 263. Arthur C. and Eliza Rust were enumerated in the 1900 Westfield, Hampden Co., MA, federal census. He was a plumber, age 36, she was 34. The only child in the household was JohnR. 2 months. 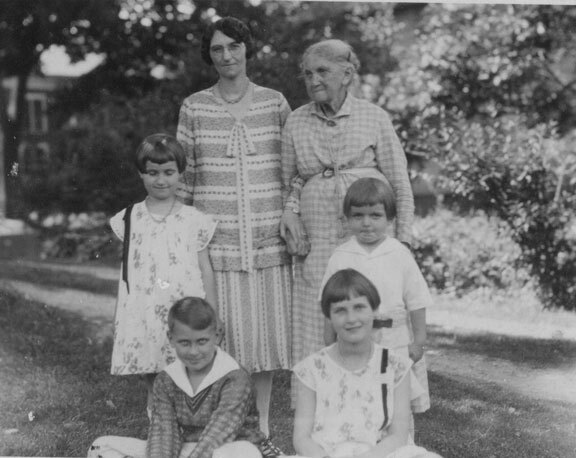 Arthur and Eliza R. were enumerated in the 1920 Westfield, Hampden Co., MA, federal census. He was 56, she was 54. Children in the household wre James M. 18, Eleanor R. 15, and Philip E. 14. Arthur and Elisa R. were enumerated in the 1930 Westfield, Hampden Co., MA, federal census, ED 208. He owned a plumbing shop and was 66; she was 64. There were no children in the household, but mother Jula A. was living with them. I, H. E. Hayden of said State and County, being of sound mind and disposing memory, mindful of the uncertainty of life, and wishing to leave written instructions as to the disposal and management of my property after death, do now make and declare and publish this my last Will and Testament hereby revoking all other Wills by me heretofore made. and by the seventh item of his last will and testament. And whereas I have advanced to Mary Whitner Five Thousand five hundred Dollars: Therefore it is my desire that the other children, viz: Julius A., Nellie, and Reuben C. Hayden, to whom no advancements have been made, shall from their deceased father's estate receive each the sum of Five Thousand Five Hundred Dollars, and that Leslie Thrasher and Julia Hightower shall each receive therefrom the additional sum of Five Hundred Dollars, and thus equalize all the advancements to each and all in the sum of Five Thousand Five Hundred Dollars, and if the estate of their deceased father shall prove insufficient for that purpose, then I desire and direct that such equalization shall be made up and completed from the rents, income, or sales of my own estate: and in such division and distribution the child or children of a deceased child shall stand in loco parentis and take the share to which the deceased parent would be entitled to in life. Item Second. I bequeath to my children all my real estate in Marion County, State of Florida, and all my real estate in Fulton County, State of Georgia, including the Arlington Hotel property and the [Cannon] House property and stores in the Gate City Block on Marietta Street, Atlanta, Georgia, for and during their natural lives: remainder to their children. And should any one or more given children die without issue, his, her, or their share and interest in my estate shall be equally divided among the other children, and the children of such as may be dead; a child or set of children to stand in loco parentis. Item Third. It is my will and wish that, should a majority of my children desire a sale be made of my estate for the purpose of a division, my executors or majority of them shall make a sale thereof at public outcry, to the highest bidders, and out of the proceeds, all my children shall first be made equal, that is to say, they shall each receive an amount in the manner hereinafter designated, which added to the amount they shall have before received from their father in his time and from his estate and from me in my lifetime and from my estate shall make the sum of Five Thousand Five Hundred Dollars without taking into account or charging Lucy Harrison with the extra Five Thousand Dollars charged up against her in and by the before mentioned seventh item of the last will and testament of her deceased father and then the remainder and balance to be divided equally, share and share alike, nevertheless said proceeds are not to be paid over in cash funds but my executors here and after named or a majority of them are required to invest such amounts as my children may be entitled to receive in real estate and which each child may designate or select for him or herself; the deeds thereto should be taken in the names of the respective children for and during their natural lives, remainder to their children. Nevertheless, with the expressed right and authority, set out in such deeds, to sell the same without obtaining an order from the courts to do so, for the purpose of changing such investments into to other property, and in case of the death of any of my children before such sale and reinvestment of the said funds aforesaid, leaving child or children then and in that event the funds of such child or set of children shall be invested in real estate in their names, by my executors or a majority of them and the Guardian or Guardians of such child or set of children. Item Fourth. Should a majority of my children not desire a sale and division of my property as contemplated by and in the foregoing item of this Will, then my executors or majority of them shall manage and control the property, pay taxes, Insurance, and repairs and divide the net income pro rata among them till all shall have received the sum of Five Thousand Five Hundred Dollars and thence forth there shall be an equal division between them all. It being my will, wish, and desire that the amounts which may be realized from any and all sources, from the estate of my deceased husband, shall be brought in and taken into account in the division of my estate and the equalization thereof among the children so that none shall have or obtain an advantage over the other just as if the estate of my deceased husband and of my own were one estate. And the real estate shall remain in and under the control of my executors so long as the majority of my children in life shall not desire a sale thereof for division. And in the event of the death of any of my children leaving child or children surviving, then the share or shares of such deceased child or children to be paid to the Guardian or Guardians of such child or set of children. Item Fifth. I will and direct in that in the case of the death of any one or more of my executors, a majority of my children shall choose others to act in place of such as may die before the administration of my estate is completed and such as may be selected shall have the same power and authority as though appointed by me. Item Sixth. It is my will and desire that should either Julius A. or Ruben C. Hayden die after marriage without issue, then their wife or wives, as the case may be, shall have hold and enjoy the rent, issues and income of and from their respective husband's estates so long as she or they remain unmarried and no longer, and after such marriage the estate or share or shares of the said J.A. Hayden and Ruben C. Hayden shall be divided in accordance with the second and third items this my Will. Item Seventh. I now nominate constitute and appoint my children Leslie Thrasher, E. H. Phillips, Julius A. Hayden and Ruben C. Hayden the executors of this my last Will and Testament and they shall not be required to give bond nor shall they be required to make returns to any Court, but they shall keep plain books of accounts and shall satisfy the other children that the estate is being properly managed and the proceeds and income paid out in accordance with this Will. Item Eighth. Any amounts I may advance to Julius, Nellie or Ruben in money or real estate, and which is intended as an advancement by me during my life shall be taken into account and charged against them or either of them, when a division or distribution is made of my estate. We the undersigned, witnesses at the request of H. E. Hayden have signed the same in her presence and in the presence of each other, and she signed the same in our presence and here declare the above instrument to be her last will and testament. Whereas, I Harriet E. Hayden have made my last will and testament in writing bearing date April 12th, 1893 and for good reasons I desire to make additions thereto. Now, I do by this my writing, which I do hereby declare a codicil to my said last will and testament and to be taken as a part thereof, order and declare that my will is that in my plan of equal division of my estate in advancements made during my life and in the distribution of my estate after my death. That Julius A. Hayden shall be charged with sum of Three Thousand and Five Hundred Dollars which is held by me as trustee for him which I have advanced to him since April 12, 1893. 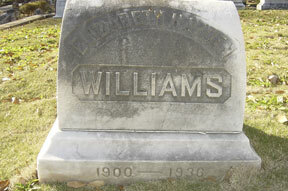 That Nellie H. Williams, wife of J. G. Williams. shall be charged with the sum of Four Thousand Eight Hundred and Seventy-Seven Dollars, which I have advanced to her since the 12th day of April, 1893. I further order and declare that my will is, that all money or property which may be found to be due to Mary H. Whitner shall be paid to E.H. Phillips and L.H. Harrison, and whom I nominate, constitute and appoint trustee for said Mary H. Whitner and her children, and same to be by them used, invested and managed for the maintanence and support of said Mary and her children, during the life of the said Mary--remainder in trust for her children till they shall arrive at the age of 21 years. Should either of said trustees die, the surviving trustee shall have power to act. They shall also manage and control the real estate in Sanford, Florida, viz: lot 8, block 2, tier 5 of Sanford, according to E. R. Traffords map of said town, which is now held in my name for said Mary and her children, as trustee. The said trustees (or one of them, in case of the death of either) are hereby granted the same power and authority that I as trustee have over said property, in the sale thereof on such terms as they think best, and to reinvest the proceeds derived from such sale in other property in the name, and for the use of, the said Mary and her children. Also to collect the rents and income thereupon and use the same for the advantage, benefit and maintenance of said Mary, and her children, and without an order of Court, and without bond. Nevertheless, if said Mary should die without leaving child or children, or descendant of children or child, then said property shall revert to the brothers and sisters of said Mary, or to their heirs in accordance with the previous items of this will. I furthermore desire that the house and lot known to us as land section 85 of 14th district of Fulton County, Georgia, commencing at a point on north side of Thurmond Street, 164 feet west of NW corner of Thurmond and Eliott Streets, running thence west along the north side of Thurmond street 36 feet, thence north 50 feet, thence east 36 feet thence south 50 feet to point of beginning. The house on said lot is known as nos. 79 and 81 Thurmond St. and it shall be used by my executors for the purpose of keeping up my cemetery lot. If it is desirable at any time to sell the property, my executors are empowered to sell the same and invest the proceeds and use the income therefrom, or as much as is necessary, for the purpose aforesaid. In witness whereof I hereto set my hand and seal this day, the 26th of April at Sanford, Florida 1899. Signed and sealed in the presence of H. E. Hayden at her request, in her presence and in the presence of each other. We do solemnly swear that this writing contains the true last Will and Codicil of the within named Harriet E Hayden, deceased, so far as we know, or believe, and that we will well and truly execute the same in accordance with the law of this State. So help us God. Sworn to and subscribed before me, this 2nd day of April 1900. Sworn to me and subscribed before me this 4 day of April, 1929. Filed in office January 1st, 1900. Proven in solemn for and ordered recorded April Term 1900. Sworn to and subscribed before me, this 8 day of January, 1936. Sworn to and subscribed before me, this 24th day of May 1949. Accepted and approved May 25, 1949. She died on 4 December 1899 at age 70. She was buried at Oakland Cemetery, Atlanta, GA; Block 8, Lot 305. Nellie Hayden was born on 16 June 1867 at GA; GS.1 She was the daughter of Judge Julius A. Hayden and Harriet E. Cone.1 Nellie Hayden married John Griffith Williams on 30 November 1897 at Atlanta, GA. Nellie Hayden died on 18 August 1954 at age 87; GS. She was buried at Oakland Cemetery, Atlanta, GA; Block 8, Lot 305. The marriage of Miss Nellie Hayden and Mr. John G. Williams, which occurred the afternoon of November 30th, was a very quiet occasion, at which only the relatives and a few intimate friends were present. The ceremony was performed at 5 o'clock at the home of the Bride's sister, Mrs. George Harrison, by Rev. Dr. Barnett, of the Presbyterian church. The bride's niece Miss Lucy Harrison, acted as maid of honor, and the bridesmaids were Miss Jennie English and Miss Ruth Cunningham. The bride entered the drawing room with her brother, Reuben Hayden, and the groom was escorted by his best man, Dr. Rusain, of Washington, D. C. Mr. Julius A. Hayden and Mr. Shepard Bryan acted as groomsmen. The bride wore a becoming traveling gown of dark green cloth, tailor made; her hat was of green, stylish in trimming, and she carried bride's roses. The bridesmaids wore tailor gowns of dark cloth, black plumed hats, and carried bouquets of pink roses. After the ceremony an elegant repast was served, and Mr. Williams and his bride left on the 7:30 train for Washington. The handsome home of Mrs. Harrison was beautifully decorated for the occasion of the wedding in a profusion of roses, and the dining room, with its table decorations of white and green, presented a brilliant and artistic scene. The bride as Miss Nellie Hayden was a young woman admired and beloved for her lovable character, refined nature and modesty. She is the youngest daughter of the late Judge Hayden, who was one of Atlanta's wealthiest pioneer citizens, and on her mother's side represents an old and prominent Georgia family. Mr. Williams is a prominent young lawyer of Washington city, and is well known and popular, both professionally and socially. During his brief visit to Atlanta he made an excellent impression, and it is with a source of great regret that Mr. Williams and his bride will make their home in Washington City. Mary Hayden was born circa 1865 at GA.1 She was the daughter of Judge Julius A. Hayden and Harriet E. Cone.1 Mary Hayden married Richard H. Whitner on 20 November 1888 at Sanford, Orange Co., FL. Mary Hayden was buried at Oakland Cemetery, Atlanta, GA; Block 8, Lot 305. Julia Augusta Hayden was born circa 1857 at GA.1 She was the daughter of Judge Julius A. Hayden and Harriet E. Cone.1 Julia Augusta Hayden married Harry Homer Hightower on 14 December 1881 at Sanford, Orange Co., FL.2 Julia Augusta Hayden died on 1 December 1908 at Atlanta, Fulton Co., GA. She was buried on 3 December 1908 at Oakland Cemetery, Atlanta, GA; Block 8, Lot 305. Sanford was in Orange County, until 1913, when the north end of the county pulled away and formed Seminole County. Any records prior to 1913, are "Orange County", and after 1913, then become "Seminole County". Henry and Julia were enumerated in the 1900 Buckhead, Fulton Co., Atlanta, GA, federal census, at 167 West Peachtree St. He was a wholesale grocer age 42, she was 42. Julia was listed as having had three children, and all three were listed as still living. "Nettie" was listed as 16, born May 1884; Ida was listed as 13, born J** 1887. Harry H. was enumerated in the 1910 Atlanta, Fulton Co., GA, federal census at 167 West Peachtree St. He was a wholesale grocer age 50. Nellie was 25, Ida was 23. Mrs. Julia Hayden Hightower, after an illness of over a year, died Tuesday night at 10:15 o'clock at her home, 167 West Peachtree street. Mrs. Hightower was the wife of Harry H. Hightower of the firm of Hightower, Hallrhan & Co. She leaves two daughters, Nellie and Ida Hightower. Mrs. Hightower, through the perfect sweetness of her character and her particular loveableness, had made an unusually wide circle of friends, to whom her death comes as the source of regret. She was esteemed by all who knew her, loved deeply by her friends. She took an especial interest in religious affairs, and for years has been a devout member of the First Presbyterian church. Funeral services will be held Thursday afternoon . . . at the residence. . . Interment will be at Oakland cemetery. Reuben Cone Hayden II was born on 5 October 1911 at Washington, DC.1,2 He was the son of Julius A. Hayden and Emma Louise Mattson. Reuben Cone Hayden II died on 25 April 1996 at Sevierville, Sevier Co., TN, at age 84.1 He was buried at Oakland Cemetery, Atlanta, GA; Block 8, Lot 305. [S182] Social Security Death Index (on-line), Ancestry.com, SSDI, Ancestry.com, SSAN 181-28-5419. 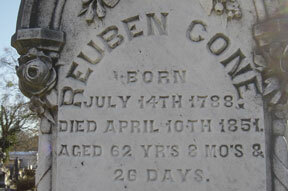 Judge Reuben Cone was born on 14 July 1788 at CT.1 He married Lucinda Shumate.1 Judge Reuben Cone died on 10 April 1851 at age 62. He was buried at Oakland Cemetery, Atlanta, GA.
Mason Shumate was of French Huguenot descent. The name in France was De Shumate, and the ancestors of Mason were called by that name for some time after they emigrated to America; but the dropped the "De" and have since been called plain Shumate. Mason Shumate was born A. D. 1764 in Farquiar county, Virginia. He married Miss Nancy Gatewood of the same county. He moved from Virginia to Spartenburg, SC in 1804, and from there to Decatur, DeKalb county, Georgia in 1824. Decatur, at that time was nothing more than a collection of about a dozen log huts. The Indians had just moved to the west side of the Chattahoochee. Decatur was a trading post, and the Indians would come over there in droves of thirty or forty to sell their pelts, baskets, moccasins and other wares. There were generally peaceable, but he remembrance of having been driven from their old hunting grounds would sometimes incite them to commit depredations on the whites, and the whites were so scattered in small settlements over the country that they fell easy victims of the savages before they could organize and drive the Indians over the river. Mr. Shumate kept the first hotel ever opened in Decatur. After living in Decatur a few years, he moved to his plantation, about one mile west of Decatur, where he and his slaves engaged in planting, as long as he lived. The land in and around Edgewood was owned by him. He used it for a hog range. His administrator, as late as 1850, sold 100 acres of it for $700. It is now worth about $300 per acre. He was one of the founders of the Presbyterian church in Decatur. He was an intelligent, well read man for his day, and gave his children the best education he could. He was thoroughly honest, and was kind and generous to a fault; was a devoted father and kind master. Everybody in the county knew him and honored him. He died in 1849, leaving nine children, Joseph D., Lucinda, Harriet, Berryman, Sarah, Cynthia, Elizabeth, Franklin, and Eliza. His descendants now number about 125. Joseph D. Shumate married Amelia Montgomery, daughter of Major J. M. C. Montgomery. He resided near Marietta, GA, many years. He moved to near LaFayette, GA, and from there to Texas in 1865, where he died. His family consisted of four sons and three daughters. 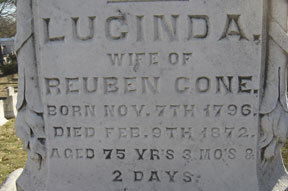 Lucinda Shumate married Reuben Cone, a northern man. He was a very influential and public spirited citizen. He was for some time judge of the inferior court of DeKalb county, and was quite wealthy. He owned a large quantity of land. He owned three or four hundred acres of the land upon which Atlanta is built. He moved here while Atlanta was Marthasville, and resided on the lot where Dr. W. F. Westmoreland now resides, and where the "Arlington house" stands. The "Arlington" is still owned by the family. Marietta and Peachtree streets, as far out as Simpson street, and many other parts of the city, are on land once owned by him. He donated the land on which the First Baptist and First Presbyterian churches are built. He was among the first to predict that Atlanta would be a large city, and he never lost faith in it. He was always ready to lend a helping hand to every things that tended to build up our city. He divided his land up into small lots and sold at small figures and on long time, in order to induce people to settle here. He laid off Marietta strteet and planted trees on either side with a row in the center. The center row is gone, but most of the others stand. Cone street was named for him. Atlanta has never had a citizen more devoted to her interests. He was one of the founders of the First Presbyterian church; gave the lot and contributed as much as anybody to build the church building. In fact the Shumate family and its connections constituted more than half, I think, of the small but devoted band that organized that church. Judge Cone was a true Christian, kind hearted and charitable. No one ever went to him in trouble that his heart did not sympathize with and his had relieve. I have often thought it such a pity that he did not live to see the city of his love grow to the proportions he predicted for her. He died here in April, 1851, while building for himself and family the house now known as the "Austell" mansion. He left his widow and one child, a daughter married to Judge Julius A. Hayden. Judge Hayden was also one of the judges of the inferior court, and held many other positions of honor and trust in the city and county. He was, and is, ever devoted to Atlanta's progress and prosperity, and ready to promote any enterprise tending to build up our city. He was president of the first gas company. He sold off his lots on reasonable terms and would give as long time as the purchasers wanted, and rarely pushed a party for the purchase money. On account of his kind, genial, hospitable, charitable, unselfish and public spirited disposition, he is and has been universally popular here. I do not believe he has an enemy in the world. He is one of the largest real estate owners. He and his good wife have a large and interesting family of six daughters and two sons. His daughters are Mrs. A. M. Thrasher, Mrs. T. J. Phillips, Mrs. George W. Harrison, Mrs. Harry Hightower and two young ladies and two sons. The judge and his family reside here and in Florida, where he has large interests. 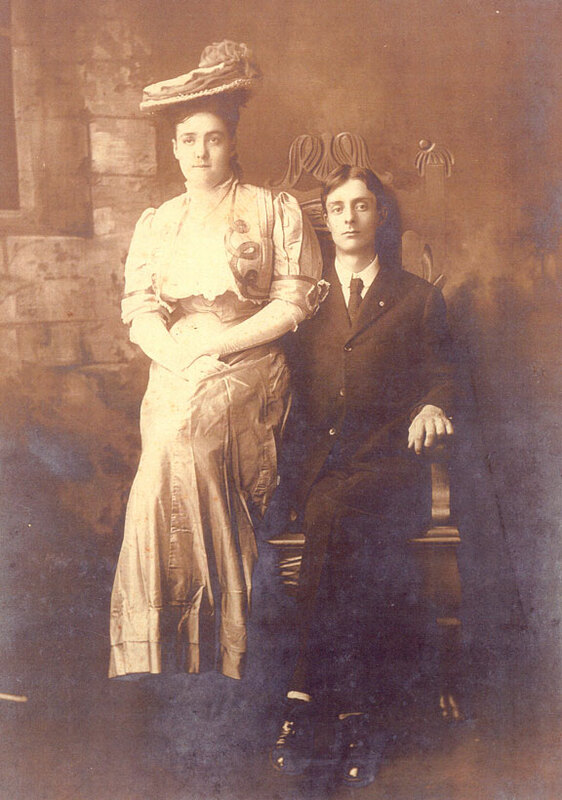 Berryman D. Shumate married Miss Thusza Farrar. He was an elder of the First Presbyterian church of this city, and was one of the most devoted Christians I ever knew. They had four sons and three daughters. Their sons, G. D. Shumate, Jr, a lawyer, Chamberlain S. and Francis Shumate reside at Clarkston, GA, and their daughter, Mrs. James Thompson, at Norcross, GA.
Sarah Shumate married Colonel Jesse C. Farrar, who was a remarkable man and well known all over Georgia. He died here a few years ago. Their family consisted of three daughters and one son. Mrs. Laura E. White, the widow of the late John C. White, is one of these. Mr. and Mrs. White were among the earliest settlers of Atlanta. He was one of our most honest citizens, who by patient industry, and the aid of his good wife, accumulated a nice little fortune. She has two daughters, her only children. One of them married my particular friend, George M. Hope, of this city, and the other recently married Walter Tomlinson, of Sanford, Fla., where they now reside. Another of Colonel Farrar's daughters married Dr. H. L. Currier, who was one of our first city surveyors and engineers and a first class one he was too. They are both dead, and their only child is our esteemed fellow townsman, Charles E. Currier, of the firm of Tanner, Currier & Heath. My old friend, R. M. Farrar, cashier of the Merchants' bank, is a son of Colonel Farrar, by second marriage, with the daughter of Lochlin Johnson, of DeKalb county. Cynthia Shumate married Daniel Stone of DeKalb county, of Scotch descent. He was for years clerk of the superior court of DeKalb county, and was one of the most popular men of that county. They are both now dead. Their family consisted of five sons and two daughters. Among these are O. M. Stone, of Augusta, GA, and Frank J. Stone of Chattanooga, Tenn., both gentlemen of high standing where they live. Elizabeth Shumate married E. G. Adams. Their family consisted of two sons and three daughters, now residents of Mississippi. Franklin Shumate married Eliza Simms, of Troup county, Ga. They hafve two sons and two daughters, all residing near Clarkston, GA. Eliza Shumate ws the youngest of the family, and married John Glen. Mr. Glen was born in South Carolina, and is of Scotch Irish descent. On this mother's side he is a lineal descendant of Captain James Cook, the world-renowned sailor, as the first of mankind who circumnavigated the earth. Mr. Glen, was for ten years clerk of the superior court of DeKalb county. He was the agent of the Georgia railroad, at Decatur, before the road was competed to Atlanta, and has been connected to with the road for over forty one years. He was mayor of Atlanta in 1855. Besides this, he has held many other positions of honor and trust there. I think John Glen is the most modest man I ever knew. He has never passed for what he is worth. He has been, and is, a man of considerable ability. He and Mrs. Glen have reared a family of ten children, four sons and six daughters--seven of whom are now living. His daughters are Mrs. John C. Evins, Mrs. Charley Elzre, Mrs. Robinson, Mrs. Johnson, and Mrs. Caldwell. They have two sons living, John Cook Glen, and the other not married, I think. They nearly all live at or near Atlanta, and are a lovable and loving family. Mr. Glen now resides at Kirkwood, within a mile and a half of where he and his good wife were married over fifty-five years ago. How beautiful and lovely that is! Liked together by the golden cares of love for fifty-five years! May the evening of their days be spent without a shadow. Altogether, I think the distinguishing characteristic of the Shumate is, the pains they have taken to rear and educate their children, according to the old bible rule, "in the nurture and admonition of the Lord." Lucinda Shumate was born on 7 November 1796 at VA; GS.1 She married Judge Reuben Cone.1 Lucinda Shumate married Judge (?) Underwood. Lucinda Shumate died on 9 February 1872 at age 75; GS. She was buried at Oakland Cemetery, Atlanta, GA; Lot 8, Block 305. Elizabeth Leslie Hayden also went by the name of Leslie Hayden. She was born on 24 October 1847 at GA; GS.1 She was the daughter of Judge Julius A. Hayden and Harriet E. Cone.1 Elizabeth Leslie Hayden married Albert M. Thrasher on 2 December 1869. Elizabeth Leslie Hayden died on 7 February 1935 at age 87; GS. She was buried at Oakland Cemetery, Atlanta, GA; Block 8, Lot 305. Albert and Leslie's marriage date is from the IGI index, however, there is not a source listed in the IGI index, on the LDS website. It is member contributed, from "compiled" sources. Albert M. and Leslie were enumerated in the 1880 Precinct 2, Orange Co., FL, federal census. He was a lawyer, age 30; she was 30. The only child in the household was Eva H., 9. They were only a few households from Judge Hayden. Albert M. Thrasher who married another daughter of Judge Hayden's (Leslie Hayden) was very prominent in Sanford, and built several buildings with are still standing today in our downtown. He owned the "Ice and Cold Storage Co." and also built a saloon in town. The Thrasher's spent many years here in Sanford. A.M. Thrasher's main occupation was a lawyer, with his law office in downtown Sanford in the 1880's. In 1883, Albert M. Thrasher added "Fireman" to his list of occupations. The "Sanford Hook & Ladder Company #1", was established on: April 9, 1883, with "A.M. Thrasher" as one of it's Fireman. (On that date, a "Hook & Ladder Company" and a "Hose Company" was formed, Albert was on the Hook & Ladder Company). Also, Albert M. Thrasher was a Confederate Veteran, from GA. Here in Sanford, we had a Confederate Veteran Camp by the name of "General Joseph Finegan Camp". Albert Thrasher served as an officer in the Confederate Veterans Camp, at least in 1893 & 1894. (From the magazine "The Confederate Veteran"). As far as Albert Thrasher's military service, I have found his records of Confederate Service in GA. But, I find him going in as a Private and being discharged as a Lieutenant, with Distinguished Service. Here in Sanford, just about every record of reference that I find on Thrasher, refers to him as "Colonel Thrasher"....as does the City of Sanford website above. So....I don't know if he just used "Colonel", since he got out of the Confederate service as an officer....or if maybe the rank of Colonel is what he held, in the Gen. Joseph Finegan Confederate Veteran Camp. One more thing about Judge Julius A. Hayden. He served nearly every year as the "Chairman" of the "Orange County Fair", here in Sanford, in the 1880's. 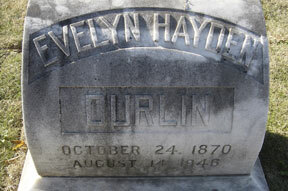 Harriet Evelyn Hayden also went by the name of Evie Hayden. Harriet Evelyn Hayden also went by the name of Ivy Hayden. She was born on 16 July 1849 at GA.1 She was the daughter of Judge Julius A. Hayden and Harriet E. Cone.1 Harriet Evelyn Hayden married Thomas Phillips. 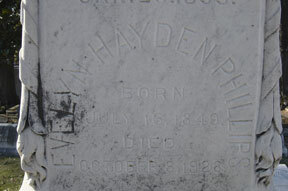 Harriet Evelyn Hayden died on 8 October 1928 at age 79; GS. She was buried on 9 October 1928 at Oakland Cemetery, Atlanta, GA; Block 8, Lot 305. Thomas and Eva were enumerated in the 1880 Precinct 2, Orange Co., FL, federal census, next to Judge Hayden. He was a clerk, age 36, she was 31. The only child in the household was Frank, 7. Funeral services for Mrs. Evelyn Hayden Phillips, widely known church worker and member of one of Atlanta's foremost pioneer families, will be held at 3:30 o'clock this afternoon from the First Presbyterian Church. The Rev. J. Sprole Lyons, assisted by the Rev. J. K. Coit of Nachoochee, will officiate and interment will be at Oakland. Mrs. Phillips died early Monday morning at her residence in the Ponce de Leon apartments at the age of 79, after a protracted illness. Mrs. Phillips was an active leader in religious activities, and in church and social circles she was warmly admired. While the passing of the beloved Atlanta woman was not sudden, news of her death came as a great shock to her many friends and relatives. Up to the time of her illness six months ago Mrs. Phillips participated prominently in church work being forced to retire recently from active work due to poor health. Born in Atlanta in 1849 at the old Hayden homesite, corner of Spring and Marietta streets, Mrs. Phillips lived for nearly four-score years in her native city where her parents distinguished themselves as pioneer citizens. 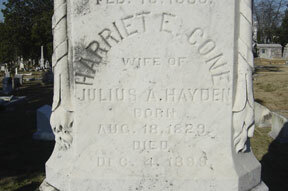 She was daughter of the late Judge Julius A. Hayden and Mrs. Harriet Cone Hayden and granddaughter of Judge Reuben Cone, in whose honor Cone Street was named. Mrs. Phillips is survived by a son Frank P. Phillips, of Columbus, Miss; three sisters Mrs. A. M. Thrasher of Montreaux, Switzerland, Mrs. George W. Harrison of Atlanta, and Mrs. John G. Williams of Evanston, Ill; a brother, Julius A. Hayden of Philadelphia; two nieces, Mrs. Frank L. Fleming and Miss Nellie Hightower, both of Atlanta, and a nephew, George W. Harrison, Jr. of Atlanta. Thomas Phillips was born circa 1843.1 He married Harriet Evelyn Hayden, daughter of Judge Julius A. Hayden and Harriet E. Cone. (?) Durlin married Evelyn Hayden Thrasher, daughter of Albert M. Thrasher and Elizabeth Leslie Hayden. George Washington Harrison Jr. was born in July 1884 at GA.1,2 He was the son of George Washington Harrison and Lucie Minerva Hayden. George Washington Harrison Jr. died on 25 November 1936 at 1654 Peachtree St., Atlanta, Fulton Co., GA, at age 52; at home, unmarried. He was buried at Oakland Cemetery, Atlanta, GA; Block 8, Lot 305. Harry Homer Hightower was also known as Henry Hightower.1 He was born in January 1857 at GA.1 He married Julia Augusta Hayden, daughter of Judge Julius A. Hayden and Harriet E. Cone, on 14 December 1881 at Sanford, Orange Co., FL.1 Harry Homer Hightower died after April 1910. He was buried at Oakland Cemetery, Atlanta, GA; Block 8, Lot 305. John Griffith Williams was born on 28 March 1866. 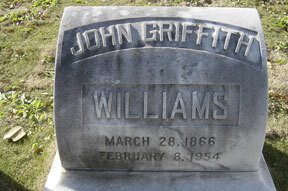 He married Nellie Hayden, daughter of Judge Julius A. Hayden and Harriet E. Cone, on 30 November 1897 at Atlanta, GA. John Griffith Williams died on 8 February 1954 at age 87. He was buried at Oakland Cemetery, Atlanta, GA; Block 8, Lot 305. Albert M. Thrasher was born on 10 July 1840 at GA; GS.1 He married Elizabeth Leslie Hayden, daughter of Judge Julius A. Hayden and Harriet E. Cone, on 2 December 1869. 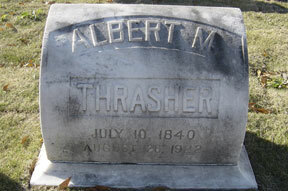 Albert M. Thrasher died on 26 August 1922 at age 82; GS. He was buried at Oakland Cemetery, Atlanta, GA; Block 8, Lot 305. [S567] Southern Historical Association Memoirs of Georgia, page 809. Lucy Hayden Harrison was born in June 1880 at GA.1 She was the daughter of George Washington Harrison and Lucie Minerva Hayden. Lucy Hayden Harrison died on 22 July 1919 at 1338 Peachtree St., Atlanta, Fulton Co., GA, at age 39; at home, unmarried. She was buried at Oakland Cemetery, Atlanta, GA; Block 8, Lot 305. NH Holcombe was the son of US Holcombe. Clerk for the Supreme Court of Georga for moe than 50 years and Past president of the Georgia Bar Association. Elizabeth Hayden Williams was born in 1900. 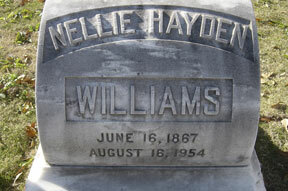 She was the daughter of John Griffith Williams and Nellie Hayden. Elizabeth Hayden Williams died in 1936. She was buried at Oakland Cemetery, Atlanta, GA; Block 8, Lot 305. Lt. Richard Howard Whitner was born on 31 December 1894. 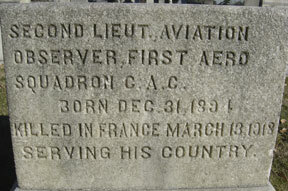 He was the son of Richard H. Whitner and Mary Hayden. Lt. Richard Howard Whitner died on 13 March 1918 at France at age 23. He was buried at Oakland Cemetery, Atlanta, GA; Block 8, Lot 305. Evelyn Whitner was born in 1890; GS. She was the daughter of Richard H. Whitner and Mary Hayden. 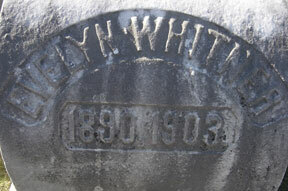 Evelyn Whitner died in 1903; GS. She was buried at Oakland Cemetery, Atlanta, GA; Block 8, Lot 305. Henry and Frances were enumerated in the 1880 Claremont, Syullivan Co., NH, federal census, ED 266, page 49. He was a retired grocer, age 35; she was 30. Children in the household were Harry 8, Harriet 7, Ralph 3, and Robert 1. Also enumerated were Sarah Morgan, mother in law, age 50, and Harriet Sanders, Mother age 71. 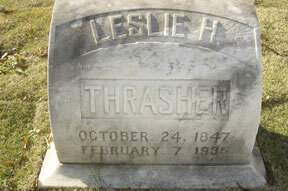 Evelyn Hayden Thrasher was born on 24 October 1870. She was the daughter of Albert M. Thrasher and Elizabeth Leslie Hayden. Evelyn Hayden Thrasher married (?) Durlin. Evelyn Hayden Thrasher died on 14 August 1946 at age 75. She was buried at Oakland Cemetery, Atlanta, GA; Block 8, Lot 305.